In the month of September 2018 Staat van Beleg could list 763 human rights violations (and 163 reports/ analyses). (see our archive) This month we focus on the Israeli control over food supplies. 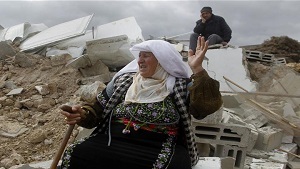 People under occupation are in a double vulnerable position. It is not only that they lack human rights but they are completely controlled, often at the mercy of the interests of their occupier. Anything Palestinians have been building up to gain a better life can be taken away from them at any time. One of those things is the control over food supplies. Over the many years of occupation Israel has used food insecurity as a weapon in its colonial project. People in Palestine make individual decisions every day but the ability of Palestinian communities to make collective decisions about their food and farming systems is curtailed by the occupation. Let’s have a look at the real version of the Hunger Games. “Who controls the food supply controls the people; who controls the energy can control whole continents; who controls money can control the world”. About 80 per cent of people in Gaza receive food assistance and other forms of social transfers which enable scarce cash resources to be spent on other essentials, preventing a further deterioration of food security and livelihood status, and reducing the impact of negative coping mechanisms. Increased power shortages have further undermined economic activity, particularly in the manufacturing and agriculture sectors, with some 30,000 out of 80,000 dunums planted with seasonal vegetable crops at risk due to irregular irrigation, and dairy cattle farmers and poultry breeders also facing significant losses. One of the organizations that provide assistance in Gaza is the UNRWA. The organization began operations on 1 May 1950 and is funded by contributions from UN member states. Its services encompass education, health care, social services, camp infrastructure and improvement, microfinance and emergency assistance. The UNRWA has a mandate to continue with its mission until there is a just and lasting solution to the Palestine refugees issue. In September the United States stopped funding the UNRWA. The problem with UNRWA, from the perspective of the Israelis and Americans who want it dismantled, isn’t that it funds aid to the needy. The problem is as Prime Minister Benjamin Netanyahu stated last January: “UNRWA is an organization that perpetuates the problem of the Palestinian refugees. It also perpetuates the narrative of the so-called ‘right of return’ with the aim of eliminating the State of Israel, and therefore UNRWA must disappear,” The United Nations Relief and Works Agency for Palestine Refugees (UNRWA) said that its mandate only comes from the United Nations General Assembly, which created it in 1950 following the Palestinians’ dispersion from their homeland with Israel’s creation by a UN resolution in 1947. The UN called in its General Assembly resolution 194, passed on December 11,1948, for the return or compensation of more than 700,000 Palestinians who were forced out of their homes and land by the armed Israeli groups. Washington and Israel are seeking to simply remove the ‘Right of Return’ for Palestinian refugees, as enshrined in international law, from the political agenda altogether. “Israel Hayom” newspaper unveiled an official Israeli document on 25 September, issued by the Israeli Ministry of Foreign Affairs, which denies the existence of millions of Palestinian refugees. UNRWA’s struggle to provide Palestinian refugees with the basic needs is not new. In this article that was published in 1958 we can read about the basic rations distributed by the agency that consisted of flour, sugar, beans and oil in amounts representing 1,500 calories a day. All this takes a lot of money to finance and the head of UNRWA at the time, Henry R. Labouisse, has had trouble convincing the nations of the world of the urgency in making good their pledges of aid to UNRWA. “While we are solely a humanitarian organization with no political role, we cannot help being reminded daily that UNRWA is one of the prices — and perhaps the cheapest — that our assembly of nations is paying for not having been able to solve with equity the political problem of the refugees from Palestine”. Following are excerpts that highlights some of the periods in which the Palestinians in Gaza were extremely restricted in their daily food supplies by Israel. In the first 12 weeks of 2006, Israel closed the crossing—the only import/export hub into the Gaza Strip—nearly 50 days. Flour mills and bakeries throughout Gaza normally keep an emergency inventory of 30 to 60 days’ supply on hand, but over a period of weeks have been forced to use that stock. With emergency supplies exhausted, the World Food Program and UNRWA’s normal food distribution program, on which 735,000 Gazan refugees depend, has come to a complete halt. The limited deliveries of flour have done little to ease the situation. Many restaurants and bakeries have closed, while the few that are open ration the amount each customer can buy, hoping to serve as many as possible before closing again. Another experiment in famine began on January 18, 2008. Israel hermetically closed all of Gaza’s borders, preventing even food, medicine and fuel from entering the Strip. The World Food Programme has reported critical shortages of food and declared that it is unable to provide 10,000 of the poorest Gazans with three out of the five foodstuffs they normally receive. After five days of extreme suffering, a group of Hamas militants took the lead, and blew-up parts of the steel wall along the Egyptian border. Within hours more than 100,000 Gazans crossed the border into Egypt. They were hungry, thirsty and sick of being locked up in a filthy cage. Once in Egypt they bought everything they could get their hands on and waited patiently for the international community to intervene on their behalf. Yet the world leaders failed them again, and on January 28, after a five day respite, the iron wall was re-erected and the Palestinians were pushed back into the world’s largest prison — the Gaza Strip. As The New York Times headline putted it on 24 January 2008: “Palestinians Topple Gaza Wall and Cross to Egypt“. 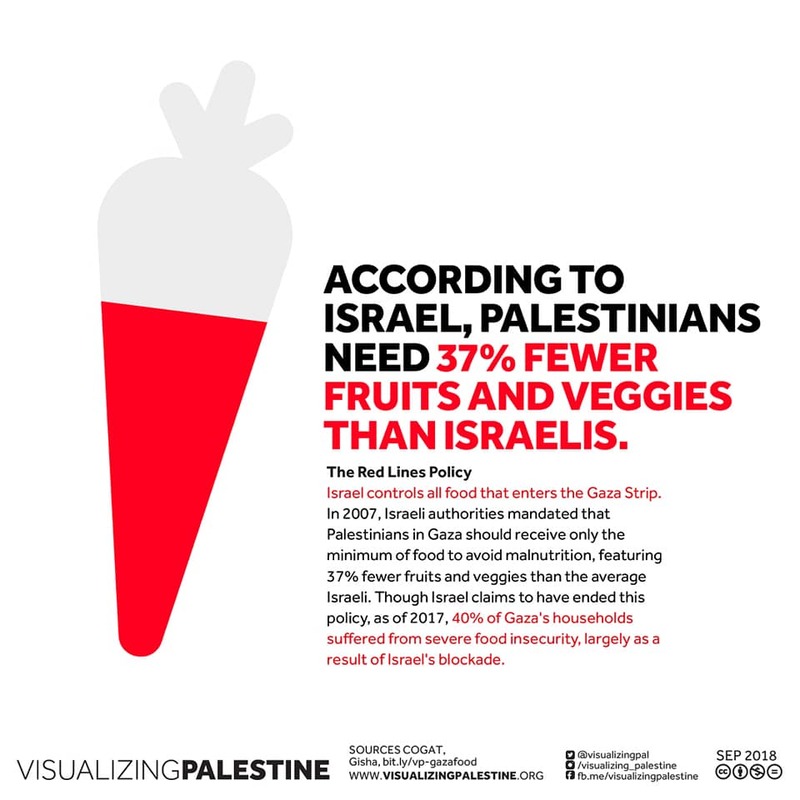 In 2012 After a three-and-a-half-year legal battle waged by the Gisha human rights organization, the Coordinator of Government Activities in the Territories finally released a 2008 document that detailed its “red lines” for “food consumption in the Gaza Strip.”The document calculates the minimum number of calories necessary, in COGAT’s view, to keep Gaza residents from malnutrition at a time when Israel was tightening its restrictions on the movement of people and goods in and out of the Strip, including food products and raw materials. The document states that Health Ministry officials were involved in drafting it, and the calculations were based on a model formulated by the Ministry of Health according to average Israeli consumption, though the figures were then adjusted to culture and experience in Gaza. In July 2018 The Head of the Popular International Committee to Support the Gaza Strip, Essam Youssef, warned of the humanitarian consequences of the Israeli authorities’ closure of the Karam Abu Salem (Karem Shalom) border crossing on the population of Gaza. The tunnels under the Egypt-Gaza border were always used as a lifeline for Palestinians since its borders were hermetically sealed by Israel and Egypt in 2007. In 2009 The World Food Programme said that after Operation Cast Lead that destroyed much of the strip’s infrastructure and agricultural land, the tunnels that provide Gaza with food, fuel, medicine and other consumer goods may have become even more crucial as an economic lifeline. After the war Israel continued to operate its commercial crossings at minimal capacity. The UN Office for the Coordination of Humanitarian Affairs (OCHA) said that on average 127 aid trucks a day were entering Gaza, compared to 475 per day prior to the Hamas takeover. During the assault, Rafah’s underground tunnels were pummeled by Israeli bombs for three weeks. Whenever the tunnels are mentioned people in general automatically relate them to Hamas and the smuggling of weapons while in reality the tunnels are mainly being used as a lifeline. Using tunnels to survive is being labeled as a clandestine activity or smuggler trade. When Israel would open the borders the same activities would be called businesses or import and export. Important to mention is the pattern we see in tunnels being destroyed particularly in post-war periods when aid is the most crucial. In the last war on Gaza in the summer of 2014 destroying the tunnels was even a primary objective. Not to mention the irony of Egypt hosting the Cairo Summit for the reconstruction of Gaza in October 2014 destroying around 521 tunnel openings in the following months. The fishing zone is another tool to cripple food supplies and the economy for Palestinians in Gaza. The fishing zone is being used as a tool for collective punishments as we saw recently after a protest aiming to break the 12-year Israeli siege. Israel planned to reduce Gaza’s fishing zone as a “punitive measure” in retaliation for the protests in spite of Israel’s expansion of the fishing zone off the Gaza coast from six to nine [nautical] miles. Territorial waters are, by convention, set at 22 nautical miles, although fishing vessels are normally allowed to work in international waters. In any case, the Israeli navy often attacks Palestinian fishermen even within the very restrictive zone that the siege imposes. Gaza is a densely populated area where almost two million people are being locked up in an open air prison, sealed off from the world without an operating harbor or airport. All movements, in or out, are being controlled by Israel. International support will only reach Gaza through border crossings controlled by Israel and is therefore subjected to Israeli permission. Israel claims that Gaza is no longer occupied since 2005 but in reality Gaza is controlled by Israel and subjected to harsh restrictions. If there is no occupation power, why is there a siege on Gaza? And as long there is a siege on Gaza Israel is in control and will decide what and how much Palestinians in Gaza will get on their plate!